We don’t ask for much, really. We may be the least vindictive, grudge-holding society ever. For the most part, we’ve forgiven Tyson, Clinton, Nixon (my father-in-law is still a hater), Tylenol and about 63,157 other transgressions. We’ll forgive Roger Clemens. We’ll be okay eventually with Mel Gibson. Same thing with Marion Jones. And Tiger. They’ve apparently set aside $500 million to “watch over the long-term impact” – which is both a curious and vague turn of phrase, and a dollar amount that’s hard to quantify. Given the scale, is that a lot? Not enough? Who knows? 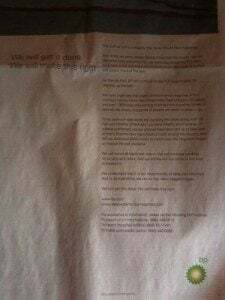 The whole ad just came off as incredibly insincere and self-serving. Contrast that with the guts and class (and good crisis management sense, despite having zero PR counsel) shown by umpire Jim Joyce in the immediate aftermath of his blown call, robbing Armando Galarraga of a rare perfect game. But Joyce’s owning of the issue gets even better. Not only did he deny MLB’s offer to skip today’s game, he met with the media AGAIN for more questions, putting on and taking off the verbal hair shirt about 50 times, until he was again in tears. 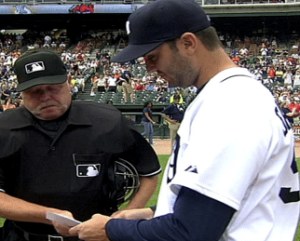 And he wasn’t the only one in tears in Detroit today when Armando Galarraga delivered the lineup card before the game, triggering a cathartic standing ovation at Comerica Park. Even in the worst of times, a simple, straightforward apology and genuine remorse can make us cry. That’s how much we are wired to forgive. We’re crying about BP too, but for a whole other reason. Billions of dollars. A coven of PR practitioners. And they can’t get just two little words right.